In the Company of Giants: Even Mom came up for petting. As her massive rostrum rose out of the water in front of me, I could see that she was covered with barnacles and lice. I was completely blown away by being able to pet her. Her skin was smooth and rubbery like her baby’s, but not as soft to the touch. I got a good, up-close look at the barnacles that encrusted her head and the large pink sea lice that surrounded her blowhole. And Jon actually had eye contact with her. She looked at him with her eye just a few inches underwater. 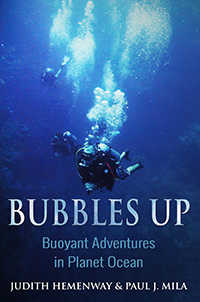 Several times she pushed Bubbles up toward the boat, and everyone had the opportunity for multiple touches. Once, Mom’s flukes sliced slowly up and sideways next to the boat, almost as if she were caressing the side, then she slipped down and away, in slow motion. Eighteen Minutes on a Rainbow: We continue to fin slowly around the second pinnacle, floating effortlessly two to four feet out from the face of the reef, greedily taking in the profusion of color and form. We drift back across the gap and move in close to the first pinnacle, working our way slowly up toward the peak. I feel like a float in the Macy’s parade, wafting in slow motion around the top of the Empire State Building. I hear carousel music in my head, and I feel as though I’ve just grabbed the brass ring…. I want to continue this ride for hours, spinning slowly in a dream around this incredible living rainbow. Spring Break Leviathan Style: A half-hour out, we find three males duking it out over a female. Two are fairly small males, probably 30 to 32 feet/tons each, but Bruiser (as I have named him) is “easily thirty-eight tons,” says Piers. Bruiser has incredible power and attitude. He sticks his head out of the water as he swims, revealing the rows of tubercles that bristle across his rostrum. He thrusts his big bulb of a chin forward, breathes heavy and hard, and snorts emphatically. With each breath his blowhole opens and closes vigorously. He also executes sharp, angular power dives. No flukes show on those dives, but we can see the muscles in his huge back ripple and surge as he slices downward. …. I just grabbed my fins, jumped in, and immersed myself in the action. I swam like hell to keep up with them. I’ve never regretted that decision. The experience of being in the ocean, in the midst of over 100 collective tons of whale testosterone raging and battling within 50 feet under and around me is the most extraordinary thing I’ve ever witnessed. Ocean Songs and Whispers: If you reach beyond the sound of your own breathing, beyond the sounds of human-made generators and engines, you can hear the constant background sounds of the ocean itself. Like a quiet summer evening in the country, with its crickets and frogs and the wind whispering in the trees, the ocean, too, has its native chorus: the faint but incessant crackle of snapping shrimp, which seems to be the basic “white noise” of the ocean reefs; the staccato crunches of parrotfish as they munch on coral; the soft whoosh of surf as it curls and breaks overhead, and even the occasional muted clunk of rocks as the surge pushes them against each other. Once while I was snorkeling in Morovo Lagoon off of Wickham Island, I noticed in one shallow sandy area that the wave action caused the broken shells and sand to tinkle like hundreds of tiny wind chimes. For a while, I stopped and listened as I floated, drifting to and fro on the waves. I had never imagined that sand could sing.